Study results suggest that new training programs on chemotherapy safety for nurses and pharmacists are urgently needed. 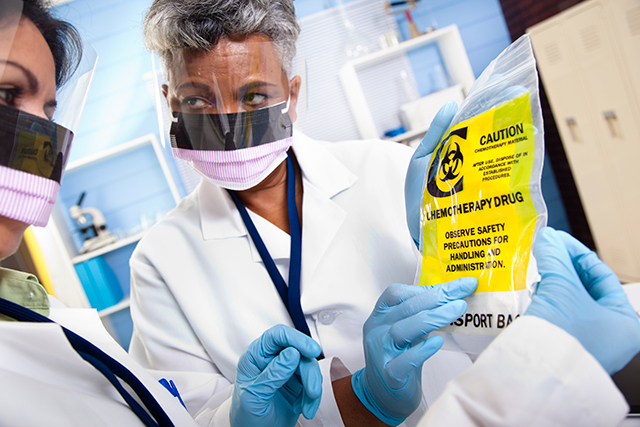 The results from the study, which were published in Oncology Nursing Forum, suggest that new training programs on chemotherapy safety for nurses and pharmacists are urgently needed. “Nurses need to know that exposure to these drugs, either through spills or indirect exposure like surface contamination, put them at risk for both acute and chronic health problems,” said lead study author Christopher R. Friese, PhD, RN, professor of nursing and professor of health management and policy at the University of Michigan, Ann Arbor. Exposure to chemotherapy occurs when health care workers inhale vapors or touch contaminated surfaces. Numerous studies have linked the handling of hazardous drugs to a variety of health problems, including reproductive issues, incidences of rare cancers, and a variety of respiratory and skin conditions. Dr Friese said unlike a needle stick, where a nurse is immediately aware of the serious health risks, the threat from chemotherapy exposure is subtle. Current guidelines recommend protective gear including double gloves, eye protection and respirators. The randomized trial included nurses from 12 ambulatory cancer programs. In one arm, nurses received one-hour educational modules about personal protective equipment (PPE) with tailored messaging addressing some of the reported barriers to use. All the participants were asked to report chemotherapy drugs spills and submit plasma samples for analysis. Those in the control arm only received educational modules. Among the 439 nurses eligible to participate, 415 (95%) enrolled in the study. The researchers assigned 189 nurses to the treatment arm and 226 nurses to the control arm. Among the participants, 378 (91%) completed the baseline survey and 257 (62%) completed the baseline and primary end point surveys (121 participants in the treatment arm and 136 participants in control arm).